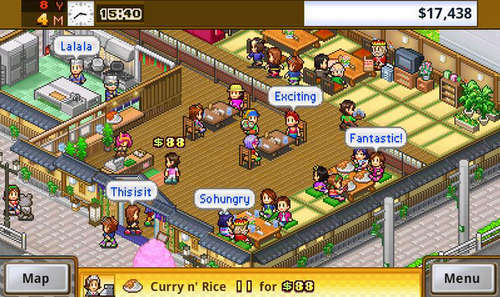 Kairosoft's latest simulation called "Cafeteria Nipponica full" allows players to manage their own restaurant, along with employees and other related tasks. As a businessman in food services, you must have a nack for food and good business management skills. In Nipponica, you'll be recruiting and training staff including cooks and servers. You'll be installing new furniture. And cooking the best dishes for the richest clients. If you're successful in your endeavor, you'll be able to move and expand your restaurant for more profit. The mod apk included features a lot of money which is the key resource in Cafeteria Nipponica. Sometimes players will find it impossible to progress without enough cash, so we made the hack to help you along the way without having to wait long hours. This November 11, 2016 update added a language pack to play in another language. You can choose to install either the paid apk version or the hacked one (the latter may not work, still working on a fix! ).